Having a finely grained street grid is incredibly important to walkable communities, as the above graphic from the Sightline Institute demonstrates. 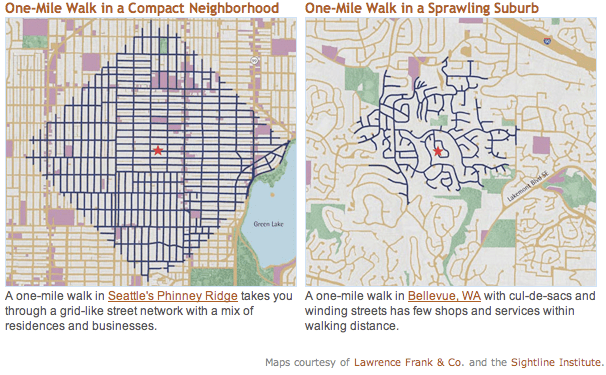 These side-by-side maps show how windy, disconnected, suburban streets make it difficult-to-impossible to get around on foot. This is why Happy City author Charles Montgomery noted in Slate that “cul de sacs are bad for your health.” It’s also why advocates for healthy cities were horrified and amused when Cato Institute “scholar” Randall O’Toole recently suggested turning gridded streets in rust belt cities into cul de sacs “so that criminals have fewer escape routes.” Spending lots of money to ruin the street grid is an absolutely terrible idea, especially in cities struggling to provide basic services to their residents. As Transport Initiatives, a U.K.-based transportation consultancy, points out, the one-mile walk coverage could be extended even more in the first example by adding some diagonal routes, like the street grids in Chicago and Washington, DC. Hat Tip to Walk Score on the graphic. Hyde Park actually has some dead ends that I have been told were crime prevention measures. Most cities in Europe are not walkable by this criterion. Clearly cities laid out in a spiderweb, medieval style street pattern (see Boston or London) are walkable too. On the other side, cities like Salk Lake City are laid out in a grid, but have huge blocks, and thus are not so walker-friendly. Walkability is a concept with many inputs (street connectivity yes, but also concentration of businesses, mix of uses, etc.) and reducing it to a simple, one criterion problem is insufficient. Another item to point out is the original article suggests “Honey, we don’t walk in Atlanta”. Indeed, as a former resident of suburban Atlanta, it’s to the point of you CANNOT walk there as precious few places actually have sidewalks… Unless you want to risk walking on a potentially busy 2 lane road or cutting over the end of some persons yard, you’re SOL. The only bright place I could think of was Decatur where sidewalks were in abundance, but Decatur does like to disassociate itself with Atlanta. I think the phrase “street grid” is being used very generally to refer to any layout, so long as it has relatively small blocks and high connectivity. Walkability is great, but it is possible to have streets that are designed to be cul de sacs for cars but that have paths that create a connected grid for pedestrians and bicyclists. It’s also important for a city not to be a slave to its grid. A highly grid-based city like San Francisco increases danger for both bicyclists and pedestrians by encouraging every single neighborhood street to be a well-connected, mini-drag strip. Motorists in a hurry cut through neighborhoods even if there is a stop sign every block, reaching speeds up to forty mph between stop signs, slowing somewhat as they approach a “stop”, and then blasting through intersections at 10-15 mph. Cities such as Vienna and Amsterdam discourage cut-through traffic in residential neighborhoods with barriers and forced turns for vehicles (restrictions not applicable to pedestrians and bicyclists.) This allows motorists who live/work/wish to shop in the neighborhood to still access the neighborhood while calming them dramatically. I’ve only been to Atlanta briefly, but the problem with many Southern cities is the intense heat and humidity in the summer. Good urban design, with deep awnings / porticos, can mitigate this to some degree (see Galveston). But the overall sparse patterns and lack of consistent shading streetwall in Houston, even in the finely gridded downtown adjacent neighborhood where I lived, a hard sell in the summer. Also, even there, the sidewalk randomly disappears in places. Think “graph” not “grid”. It’s connectivity, not the orthogonal layout. I’ll second that, Karen. SF and other strictly-gridded cities are not only somewhat dangerous because of that grid, but they’re also less interesting places to walk and bike. The visual of a gently curving street, as is often found in European cities, is a very pleasant experience. In San Francisco, even though they are not very walkable or bikeable, some of the curvier streets on Twin Peaks and Bernal Heights are much more interesting places to explore. But since capitalism has given us grids, let’s just make sure they’re optimized for people, not for cars. There are many older suburbs on grid patterns. And by older I mean well into the 1970s. Over time the maze became the dominate form. Why? It keeps outsiders out. The maze is an intentional design to keep people who don’t live there from driving, biking, or walking through the neighborhood. There is also an aesthetic preference for the maze system by some. The maze is actually the older form of street layout. The maze works to confuse invading armies. That’s why it is employed today to discourage outsiders from trying to move through the neighborhoods so designed. Someone trying to pass through becomes disoriented, lost, or just pops out where he went in. Both the grid and the maze predate the automobile by hundreds if not thousands of years. Both systems are used regardless of population of density. The reasons newer sub divisions don’t have grided streets is because the people who live there don’t want them. They want a neighborhood that keeps outsiders out. They like the appearance of it. Stop signs are not supposed to be used for speed control. Doing so makes things worse. The root cause of why people are diverting off the arterial roads needs to be discovered and addressed. LOL. The debate regarding road systems, including the grid, goes back at least to the time of Aristotle. Yes, but it was all talk until Manhattan showed the world how to maximize land use (and land value) via the grid. Central planning isn’t capitalism. I am assuming you are referring to the 1811 plan for Manhattan. That’s a top down government plan. Under free market capitalism each developer, each land owner, would develop the streets as he saw fit. Dang, you’re a pit bull! Whatever. You got me. The hairs are split, and I’ve come out on the frizzy end. Of course it’s true that there are maze-like layouts in older cities, but those mazes are very different: they have few dead ends. Although they may be confusing to a visitor, once you know where you’re going, you can get there quickly. The coverage area would be as good as (or sometimes better than) the grid in the example above. Yes, it is possible to have a grid but block off certain streets to cars while letting pedestrians and cyclists through. You can even have the traditional cul-de-sac but with pedestrian walkways between houses to tie the culs-de-sac together. Culs-de-sac are effectively liked today as a traffic-calming measure, the ultimate traffic calming measure if you care only about avoiding having through traffic, but culs-de-sac with large streets may incite speeding, even if only locals are driving there. Usual culs-de-sac have very negative impacts for pedestrians, not only are trips made much longer, but the streets are confusing and getting anywhere involves a lot of guesswork or a deep knowledge of the area. As traffic-calming measure, my own preference is to narrow streets. The idea is allowing car travel in both directions but leaving just 16-17 foot wide to cars. That way, when cars meet each other head on, they have to slow down and carefully pass each other, they interfere with one another’s progress. They have enough space to pass, but not enough space to pass comfortably. Even when they’re alone, car drivers do not drive fast on these streets, especially if the street is sidelined by walls, building, trees or parked cars. The result is that the streets are uncomfortable to use for car drivers, and the more cars there are, the less comfortable the streets are, and the slower cars go on them. Car drivers learn that lesson pretty quickly and start avoiding them for arterials. For added effect, have no sidewalk, but have pedestrians and cyclists walk on the street itself, making it a shared space. The place I know that uses this tactic at its fullest is Japan. I love those narrow residential streets (see image). Capitalism is an economic system not a political one. The danger for capitalism is that it can end up creating monolithic structures and central, read coporate, planning just as dangerous to individual choice as any top-down run government. So called “free market” capitalism tends toward monolithism in direct porportion to it supposed “freedom”. The thing with cities, suburbs and long lasting buildings is that once someone makes a choice, be it economically or politically driven, it makes furture choices by futue dwellers that much more difficult. But that is the natue of those things, so no matter. I agree with you that people who fear invading hordes will be more comfortable at the end of a cul-de-sac. I am happy they have a place to go. The problem for many on these blogs, imho, is that for people who are not in fear of invading hordes or who feel safer with a lot of close neighbors, many decisions for urban structures are overly influenced by suburban (and ex-urban) mentalities that tend to degrade the quality of the urban environment. The difficulty I, and I suspect others here, have with your comments is that you inject non-relevant politics and economics into the urbanist or urbanism focus of the blogs. Clearly politics and economics bear on what gets done. But for us the debate should first be whether something is good urban design and only after and quite separately we can debate the economics and politics. You appear to be very much on the same page as the folks on these blogs when it comes to understanding urban design. You knowledge and insight are valuable. I suspect that you feel yourself an outsider to these pages because even as your urbanist credentials are strong your political and economic views tend to be different than most here. But that may be because you have spent as much time on your poltical and economic view as your urbanist views and many here shy away from thinking too deeply about politics and economics (imho on that). You don’t even have to go to Europe to see how grids can be adapted to limit car movement while allowing people walking and biking free passage. Berkeley is a prime example of how a few planters and curbs can create cul-de-sacs that don’t kill walking and biking. Most suburban modern subdivisions don’t have usually have trick dead ends either. They are usually quite shallow and visible before going in. I try to dead reckon myself through their mazes and succeed as often or more often as I fail. Failure is coming out near where I went in or ending up getting further away from my destination. But even then I am not back tracking out of dead ends but the maze looped me around. Most true suburban dead ends are not dead ends for bicyclists. They are usually places where subdivisions stopped but weren’t connected to the next one. There will be a trail that leads to another road, bike trail, forest preserve trail, etc. I can often ‘smell’ them, knowing where one should exist and will go down a road I feel otherwise leads nowhere with faith the trail will be there. Once I know my way through by bicycle I now have routes I use by car to avoid backups and congestion except when there are bicycle only segments of course. How can I explain this most simply, Free market capitalism gives you a hundred choices of toilet paper or thousands of choices in consumer electronics. Crony capitalism gives you a monolith. One size fits all. We see monoliths in those things deemed too important to leave to the market. We see more choices than any one person can comprehend in the things deemed too trivial to interfere with. (Real, not what republicans and democrats call) Free market capitalism has a political philosophy attached to it, one of a lack of government because coercion is not permitted. Voluntaryist, property rights, free market system would probably produce somewhat different roads than what we have. However there would be consistent standardized practices for compatibility. Just like USB works across a wide range of devices just fine, the same sort of thing developed for roads naturally. Government eventually took over, but initially it was an example of spontaneous social order. On the contrary, I don’t have to introduce politics or economics at all. If you note, I replied to a comment that claimed the grid was imposed by capitalism. It’s introduced for me. Now I choose to respond because I want to. I think I ignore as many or more. Politics and economics is often in or as an underlying current in the articles as well. Recently I posted a comment to an article that was cheering declining walmart/big box sales as evidence of people adopting the this non-driving vision. My reply of course was economic in nature, it was an economic article. Many of the articles here are political and economic in nature. The movement of people, taxes, fines, etc and so forth are all part of politics and economics in the present system. Shaping the way people can travel is key to controlling a society or bringing about one’s desired vision of utopia. Travel cannot be left to chance or natural preferences of the people. Instead it must be carefully grown and shaped politically and economically so people accept it for both creating utopia and for controlling the society. We don’t live in a voluntarist system. If it were a matter of choosing to live here rather than there, then that would be fine. Or even if this website were voluntaryist in nature, but it’s not. Maybe instead of a “street grid” we should be talking about “navigable blocks”. Megablocks with few cross streets and lots of dead ends makes walking more difficult, and forces cyclists onto busier arterials in order to get anywhere. An interconnected series of streets and paths with smaller blocks would be preferable, regardless of the specific shape of those blocks. An early US road grid was established by the “Northwest Ordinance” passed in 1787 by the Congress of the Confederation (the pre-Constitutional American legislature created by the Articles of Confederation). The Northwest Ordinance was re-passed by the First Congress and signed into law by President Washington. Among other things, this law divided the Northwest Territory (Ohio, Indiana, Illinois, Michigan, Wisconsin, and the part of Minnesota east of the Mississippi) into “towns” that were 6 miles square and each town into 36 “sections” that were one mile square. Roads were often built along the section boundaries in a one-mile grid that survives today in the Midwest. You can see the grid when you fly over this part of the country. In cities like Milwaukee and Chicago, these roads have become arterials, and are the basis for their street grids. In Wisconsin, many of those 36 square mile towns still exist as units of government. For another example nearby, take 538 Terrace Spring Dr, Orlando, FL. The person living there can see the Walmart from his back window. It’s the most convenient local retail. It’s 130 feet to the north– could easily hit it with a rock. But if he wants to go shopping, he has to first go east 240 feet. Then south 800 feet. Then west 600 feet. Then north 1000 feet. Then he just needs to walk east for 350 feet through the parking lot, and he’s there. The designers of the neighborhood have built a tall wall to make sure that he doesn’t take any shortcuts. In fact, there’s a gap in the wall which would reduce his trip to a “mere” 700 feet, but it appears to have a permanent metal fence across it. But hey, they’ve built a sidewalk, so I guess they’re pedestrian friendly. Now, there may be other suburbs which aren’t nearly this bad. But this is bad. This gave me a sinking feeling. Call it premonition. Expensive + terrible idea = inevitable. What do extreme situations have to do with the typical which I described? The people who live there apparently want it that way. As much as many on this site say it’s all about neighborhood choice, utopia is never about choice. The mere fact that somewhere in Florida there are people who have disregarded the utopian teachings is enough to bring it out front and center and castigate them for it. I’ve got the answer. Don’t live there. Don’t buy homes in places designed like that. It’s quite possible to choose appropriately in suburban settings. I’ve done so myself. It’s not hard. Just have to think it out like one would do in the big city. Furthermore, where I grew up, the neighborhood kids just put holes in the fence to get to the closest retail. While not perfect, because there are still fences blocking off shortest routes for many, the stores are accessible via the residential streets. It appears to be some sort of intentional compromise. I can show other examples in the greater chicago area if need be. If you wish I can also show examples of dead ends that go places for bicyclists and peds. As well as ways around fences and so forth, but those may not show up on google maps. Extreme examples perfectly enforced are rare. People poke holes in such things every chance they get. Such barriers only endure where people who live there really want them. 1) The maze design is a lot older than 1938. In Japan narrow streets are the norm because there is little flat accessible space to build upon. Additionally most streets in many community if not most developed from footpaths and walking trails. Is Charlotte the Least Walkable City in America? How Can Suburban Communities Repair Disconnected Streets? The End of the Road for Cul-de-sacs?